Yesterday, PC World writer Preston Gralla posted a helpful review of CompanionLink for Google. The review details the dilemma many users have in synchronizing their Android phones with Microsoft Outlook. CompanionLink for Google syncs Outlook contacts, calendar and tasks with any Google, Gmail, or Google Apps Premier account. Google can then wirelessly sync your Outlook data with most smartphones using the free Google Sync service. The new Motorola DROID X, available today, rightly deserves its position is Verizon’s new flagship phone. The DROID X features a huge 4.3″ screen, a lightning-fast 1 GHz processor, an 8 megapixel camera, and it runs Android 2.1. With all these amazing features, it’s a bit surprising to learn that the DROID X does not include any way to sync with Microsoft Outlook out of the box. Google provides a free tool called Google Calendar Sync that syncs Outlook calendars to any Google account. The DROID X can be configured to then automatically sync with that Google account. However, Google Calendar Sync is a bit limited, as it only supports the primary Outlook calendar, and does not include data range options or Outlook categories support. CompanionLink is proud to offer two ways to sync Outlook with the DROID X. Sync contacts, calendar and tasks wireless via a Google account, or sync Outlook contacts, calendar, tasks and notes to the DROID X direct via USB. Both options support two-way sync, so that changes made on the phone will update in Outlook. CompanionLink’s sync solutions for the DROID X works in conjunction with an Android app called DejaOffice. 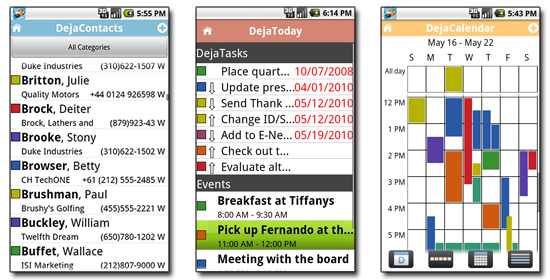 DejaOffice is a robust suite of business-class contacts, calendar, tasks and notes apps for Android. It features advanced functionality such as color-coded categories, search and sort by company name, linking calendar entries to contacts and much more. DejaOffice is a free download from the Android Market. CompanionLink has published a whitepaper that explores the options for syncing Android to the desktop. Compare features and benefits between Google Calendar Sync, the Microsoft Outlook plug-in for Google Apps Premier, HTC Sync and CompanionLink’s wired and wireless sync options. This can be extremely helpful when looking for a solution to sync contacts, calendar, tasks and notes to an Android device. Feel free to download the whitepaper for your own reference or to distribute to friends and clients.